I listen to SiriusXM College Sports radio, read sports sites, the newspapers, the magazines, all of it, despite knowing better. I get that it’s a big match up in week 1 of the season, pitting perennial powerhouse Alabama against media made contender Florida State. I know it will be a top 4 matchup and that, yes, bazillions of fans will tune into it. Blah, blah, and more blah. Is it just me, or is a summer of this enough? I am so sick of hearing about this game and every detail on every angle on every player and coach and whatever there is to write about. It really is all about the money. But, it does have me thinking about something else related. Since all the press this summer has been about these two teams (and of course Ohio State and Southern Cal’s QB) it has me revisiting this notion of the P5 and the College Football Playoff. Since the Autonomous 5 was branded, I have been critical and wanting against all odds for ECU to be able to get a piece of the purse, but it has occurred to me over time and prodded quickly along by being subjected to unabashed broadcasters kneeling at the alter of these two teams 24/7 that my desires have been ill conceived. I now think it would be better if the top teams – regardless of conference – were to simply split from the P5 and form a super-elite league, there would be nothing anyone could do and they would make even more money, establish and even bigger network and finally put to bed the notion of what is real college power or not. That’s it. No others. No rich by association (e.g., Auburn, UNC, UCLA, etc. ), no friends with benefits (Vanderbilt, Duke, Indiana, etc. ), no short term stars (e.g., Oregon, Texas A&M, Miami, etc. ), just good old school, old boy established college teams…kind of like some of the pillars of American society like the Astors, the Forbes, and the Delano families (who cashed in on Opium) or the Carnegies, Vanderbilts, Mellons, and Morgans – better known as the Robber Barons. These schools, in the college football landscape, are similar (save maybe free shoes university) that they have deep pockets and longevity…in short, they established themselves at a time where there were no rules and then parlayed it over the years. Now with that head start, these schools like to say all is fair and that they are just doing things better. Think of it this way, you show up for a race and when you get there, the veteran there establishes that he gets a 20 yard head start, you have to run backwards, and in the event of a tie, he wins. The stadium is packed and EVERYONE in the stadium fails to accept or acknowledge that you are 20 yards behind at the start and running backwards. When the race is over and you have lost, the crowd is standing in ovation for the winner, the press is clamoring for interviews and headline reads: Veteran destroys newcomer in even race. And the story goes on to discuss in great detail how great the winner was with no mention of the conditions set forth by…well…the winner. If the P5 crap that has been streaming for years is true…or makes sense, then why not really do it right and shed all the other schools taking pieces of the pie? The television rights for this league would dwarf what currently exists – if you believe the talking heads and the network gurus. Every week, again if you believe the pundits, would be a game worthy of watching. And, if you believe the pundits and powerbrokers, the product is what ALL COLLEGE FOOTBALL FANS WANT. That last point truly shocks me, but it is a persistent message. Though if all college fans prefer the P5, then explain some of the weird choices of fans across the country in this fan-driven map done by Reddit. Oh well. Oddly, teams like ECU, Boise state, UAB, New Mexico, etc., made this map which was done by polling fans by state. HOW IS THIS POSSIBLE? They could create their own oversight body…let’s call it the NFL Quality Control Unit. They could do away with the pesky things like “student-athletes,” “amateurism,” “Title IX” and suspensions for bad behavior…all those things…they get in the way of a good product. Don’t get me wrong, it is likely that all of these programs have been stepping outside the legal lines for years (success typically alludes those who follow the rules) but now they could simply do it in plain sight and be doing nothing wrong. Imagine the reality TV that would be spawned…On the recruiting trail: Follow these 5 star recruits as they party it up, hang with hookers, pit fat cat alumni against one another and end up on a team that they can make more money for. Personally, I would be glued to that show. Sadly, Pirate fans don’t have to go far to see this kind of thought process – just talk to any of a zillion UNC fans these days. But I think it is reflective of where the college football world is today. So for the love of college football, it would be great if these teams could move on and leave the others the opportunity to relieve the pressure to be elite and establish a good quality, fair environment for competition that could exemplify the best of team sports competition rather than the worst. I would probably take more interest in football if we could siphon off these semi-pro programs and let the rest get back to playing for the joy and satisfaction of the competition. Where it would matter how you played the game. Where fans would care if their team was doing things fairly and if the players for their teams not only gave a crap about the university but also were students who worked hard in the classroom. Where fans could be proud and where bragging rights truly were based on a mano-a-mano competition where the winner gets to brag and loser goes back and plans for the next meeting. It will never happen, because there is too much money being made and the schools around the country all have fat cats who will break the bank in order to brag. Winning at all costs and by any means matters to those guys too much to let go. Hopefully ECU puts together a great season and maybe goes bowling again. While, Wake Forest, Vanderbilt, Duke, Virginia, South Carolina, Kentucky, Kansas, Indiana, and the like, go nowhere but get paid and continue to be spoken about as if they are truly among the nation’s power elite on the field. Here! Here! Absolutely agree even if it means scaling back all of our big plans for upgrades. I would also make recruits meet the same general entrance requirements as non-athletes. The “elites” can pay them as much as they want and not require the athletes to even be students. If athletes (male or female) who realistically have no professional opportunity in their futures want to trade their athletic ability for a degree in a field that offers a real shot at professional employment, then I am all for it. It would also mean we could get back to truly regional conferences. Let the elites live in their enchanted forrest and continue to believe they epitomize the hackneyed idea of “student-athlete”. Well stated William and I agree completely with your additional inputs. 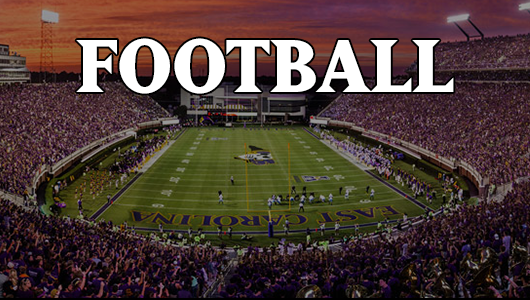 As much as I love ECU football, I really believe it is time to decouple football and basketball from universities. That adults both on the sports and the academics sides can even talk about a solution where young athletes come to school to work as athletes for the school and have no academic responsibilities is absurd. Of course, I believe Bama and FSU fans would have a hard time cheering for the Tallahassee Seminoles or the Tuscaloosa Tide. I know our friends at UNC would never stand for a local team called the Chapel Hill Tar Heels. NFL needs to establish a minor league system for these athletes who do not want or have the wherewithal for a degree. Give them a fair chance to make a living on their exceptional athletic skills. I would love following ECU given the scenario we are talking about. Cheers and thanks for taking the time to post. Great to see a post Ron. First I never understood the need for the P5 the public was not demanding it and at the time you had more non P5 programs ranked than you did in some of the so called power leagues. Clearly this was a money play based upon pure greed to further cement their control over the game and to keep the up and comers at a safe distance. Money has brought back conferences like the Big 10 and ACC who were slipping now they are stronger than ever thanks to the money. What has bothered me the most is the fact that these were never the best 64 teams in the country. If they were then perhaps I get it. Now that enough time has passed that the money has helped the traditional doormats become almost respectable where the BYU’s, Boise’s, and ECU’s of the world can’t keep up. What has made the NCAA basketball tournament is the fact that if you make the dance you have a 1 in 68 chance of winning it. People tune in to see a Butler, a George Mason, or a Florida Gulf Coast take down a national power. It shows that there is plenty of talent around and given the chance they can compete. In football forget about it. The playoff is picked based upon what they think gets the best ratings not the best teams. Why play the games if you do not want to take into account who won or lost? I don’t think we will ever see a playoff that did not include Ohio State or Alabama even if they lose 3 games they will justify their selection one way or another. I don’t know what gets me more the 24/7 coverage of these so called powers or the overall arrogance of these programs and their fans. Coaches seem to think they are teaching life lessons when the only thing the majority of these kids major in is eligibility. Ohio State pays 29 million in football coaches salaries alone. The entire ECU athletic budget is just over 40 million for all sports men’s and women’s. Yet if we were to play them in a close game all you would hear is what a great team they have, really? Money has destroyed the game period. As a fan I tune in to see a competitive game so perhaps its time as you suggest to let 16 or so NFL lite programs to do their own thing and try to bring some perspective as to what college sports were supposed to be about. First, a quick hello. been too long and I hope you and your family are doing great! Second, couldn’t agree more. One of the things I love about ECU is that most of our players are the non-elite or non-recruited guys who we take and they buy in and love their school beyond the years here. To win is to really achieve or over achieve which to me adds depth to the experience. I would hire an ECU guy any day because I know what it took for them to do what they do. I am a little concerned about he grad transfers if this is going to be an every year thing. I do think it ups the performance but at what cost? I do not want ECU to be a guns for hire school. I don’t want the fabric of the program to be worn thin by trying to be elite. Of course, I have also been the kind of guy who leaves on the horse I road in on so maybe I am just too old to get this concept that winning trumps all. How you win and with whom you do it MATTERS a lot to me. Always good to hear from you. Might be down your way again soon so maybe we can hook up. As it looks right now, I will be at the following games: WVU, UConn and I am hoping to get down to the BYU game. Last one may not happen.